Most of us in Washington State continue to reel at the fraud and negligence that characterized our election here last November. Shark Sharkansky at Sound Politics has continued on with dogged determination - he's continued to execute FOIA requests (or their equivalent at the County level) - and has continued to expose the staggering corruption in King County. Just yesterday he discovered by physical inspection dozens more additional absentee ballots - many of them from members of the armed services - that were not counted in last November's election! A week ago, working with Bob Edelmen of the Evergreen Freedom Foundation, Shark discovered and reported that the current set of King County absentee ballots (that we're going to vote in the upcoming local election) are in violation of state law - having to do with mail forwarding. These things continue to remind us of the horrid conditions that our election system remains in - but I have something to share that's a bit more, well, Heinlenian. 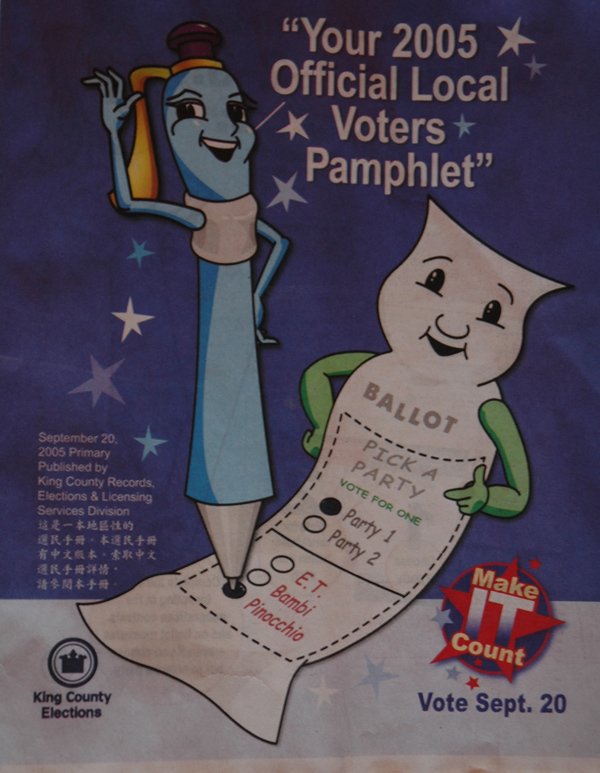 I just received my absentee ballot and my local voters pamphlet - we've got this local King County election coming up September 20th. Among the offices to be filled is that of King County Executive - for which the election department works - so you can imagine that it is important to many of us. You really can't make this stuff up folks. I think this is the most condescending piece of crap information I have ever seen in the voting process. ...Continue reading "Election Aftermath: Stranger in an even Stranger Land"
King County Executive Ron Sims has temporarily reassigned two veteran managers to help run this fall's elections and will seek $500,000 to pay for a "turnaround team" that would make longer-term changes in the dysfunctional election operation. Guess that's one term they could use to describe the most egregious affront to liberty in the elections process seen since Mayor Daley's Chicago syndicate.